Forum Index > Historical Arms Talk > Sica/other galdiatorial weapon? Posted: Fri 16 Sep, 2011 2:52 am Post subject: Sica/other galdiatorial weapon? The seller claims it's a gladiatorial fighting knife that was found from Londium. Do you think it's a fake or what it might be? I don't recall seeing anything like this before. Looks agricultural, possibly a form of stock knife ? The long spike fits into a hole or socket to act as a pivot when chopping. Either that or it might be another regional variant on a billhook/handbill. Certainly doesn't look like any gladiatorial weapon I've ever seen and, if it came from London, I'm pretty sure I'd have heard about it. Well, it *does* look like something the Uruk-hai would carry! But I would tend to agree that it's probably not a gladiatorial weapon. The spike could be a tang for a handle, making it a specialized drawknife of some sort? Someone who knows more about later tools can probably identify it. This is definately a type of drawknife. The tang would have a wooden handle, and the ring at the other end would be fixed to a staple or ring in a block of wood, to get a lot of leverage when shaping a wooden object. 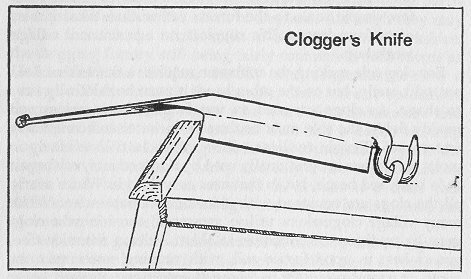 Below is a clogger's knife, which works on a similar principle (although shaped differently). That makes sense because sometimes I use the same mechanics when carwing wood with a knife. Thanks for the answers!